As our way of saying thank you, you can now earn $100 in credit when you refer a friend! Want to set your friend up with a $100 credit towards their new security services while enjoying ANOTHER $100 credit for yourself? 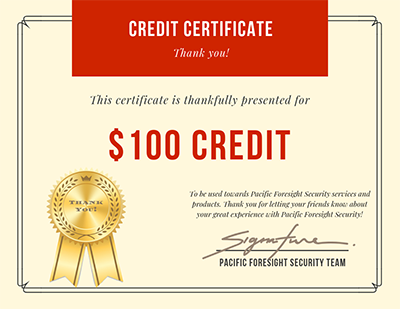 Refer your friend to Pacific Foresight Security so they can enjoy the same peace of mind you’ve enjoyed with a 24/7 monitored security system. Over time, we’ve learned that when you do a good job, word gets around. We found this out when our statistics showed that the majority of our new customers were coming to us, not because of our ads, but because their friends and family were recommending us. When we learned this, we knew our next step should be to create a referral program to thank all of you for spreading such a great message about our security services in the Phoenix metro area. If you’re one of those happy clients of ours, you can sign up for our referral plan right here. Any of your referrals that result in the sale of a new monitored security system will earn you a $100 credit towards new products, monitoring, or other security services. 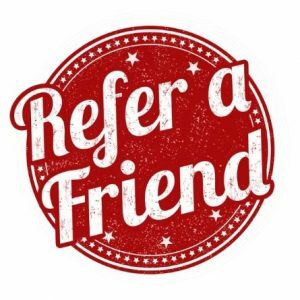 Even better, your referred friend will earn a $100 credit towards their new security service as well! Fill out the form on this page or call us with your referral at #623-979-5930. If the person you refer signs up for our service, a $100 credit will appear in your account within 60 days of when their service starts. We sincerely appreciate your referral and having you as our customer!